Legal sports betting has been sweeping across the nation. The Supreme Court overturned a 25-year old federal ban on the practice earlier this year when it struck down the Professional Amateur Sports Protection Act (“PASPA”), which prohibited single-game sports betting outside of the state of Nevada. Since the sports betting has been legalized nationwide, state officials and gaming companies alike are quickly moving to explore opportunities to capitalize on the freshly-minted sports wagering industry. Just recently, this culminated in the U.S Sports Betting Policy Summit in Washington D.C. 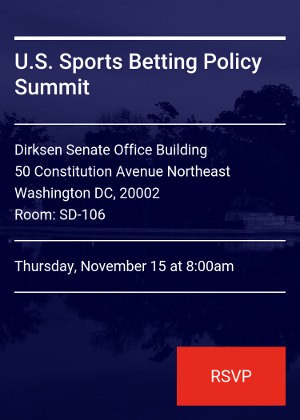 The U.S Sports Betting Policy Summit in Washington D.C. brought together leaders in sports wagering, lawmakers, and sports gambling business insiders to discuss the future of legalized sports betting. The conference on Capitol Hill lasted for nearly four hours and was held by the sports data company Sportradar. The event featured discussions between several significant casino stake holders and lawmakers including; Ohio State Sen. Bill Coley, Michigan state Rep. Brandt Iden, Vice President of Race and Sports Operations for Stations Casinos: Art Manteris, and Stanton Dodge: Chief Legal Officer for DraftKings. Lawmakers and leaders discussed some of the best possible ways to capitalize on the termination of the federal ban while simultaneously triumphing over the illegal gambling market. Lawmakers addressed the construction of effective anti-money laundering policies and other current issues in U.S sports betting policy. Likewise, industry leaders discussed thinks like the use and access of data, licensing, integrity fees, and how in-arena betting can blur the lines between gambling in stadiums and casinos. States are able to set their own rules and regulations regarding sports betting, and as a result new sports betting bills are popping up left and right. At this rate, we may be looking at a different set of rules and regulations on sports betting across all 50 states. This concept is a bit unnerving to policy makers and sports gambling enthusiasts, as the fluctuation in rules and regulations can easily lead to confusion and unintentional rule violations. However, absent a sweeping movement towards uniformization, gambling institutes and sports wagering enthusiasts alike may need to familiarize themselves with each state’s laws and regulations. This is particularly true when looking to continue recreating in sports wagering across state lines. Many regulatory experts raise an eyebrow whenever lawmakers and industry insiders get together to craft policy. However, this approach does have its advantages. By allowing regulated parties to be involved in the rulemaking process, agencies are often able to develop better common-sense regulations. However, Ed Leonsis, majority owner of the NHL’s Washington Capitals and the NBA’s Washington Wizards, warns gambling enthusiasts and lawmakers alike to not become to tangled in the speculating how detrimental legalized sports wagering could be. He instead emphasized how important it is to rely instead on a fact- and data-based perspective, and that the industry should be treated no differently than Wall Street. This entry was posted in News, Regulation and Legal on November 25, 2018 by Kayla Sherrell.